The Mississippi River may be mighty, but it’s no match for earthquakes. Over time, large quakes are capable of altering the river’s course. Now, that connection between river courses and earthquake activity is allowing seismologists to look at past earthquakes along a Midwestern fault zone with new perspective, and could enable them to more accurately assess future earthquake risk in the region. 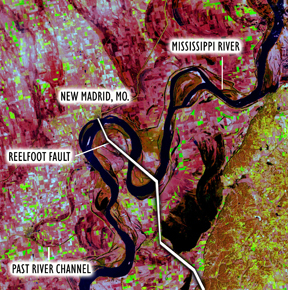 This infrared satellite image shows the Mississippi River near New Madrid, Mo., where it intersects the Reelfoot Fault. Thinner, curved lines adjacent to the modern river are remnants of the river’s past channel courses, and can reveal past earthquakes. Image is courtesy of NASA. The New Madrid seismic zone, named for New Madrid, Mo., is a major interior continental seismic zone located within the central Mississippi Valley. In late 1811 and early 1812, it produced a cluster of at least three earthquakes with magnitudes of 7 or greater, one of which was the most powerful ever recorded in the contiguous United States. The quakes were felt as far away as Quebec and straightened the course of the Mississippi River upstream from the Reelfoot Fault, one of the major faults in the New Madrid zone. Past studies indicated that, in addition to the 1811 to 1812 temblors, large earthquakes likely occurred in the New Madrid zone around A.D. 900 and 1450. Now, John Holbrook, a sedimentologist at the University of Texas in Arlington, and colleagues say they have found evidence for at least two additional large earthquake events, one between 1300 B.C. and 800 B.C., and another between 2240 B.C. and 1600 B.C. As described in the July 7 Tectonophysics, the three quake episodes between A.D. 900 and 1812 may represent a “millennial-scale cluster” — over an approximate 1,000-year period — while the two earlier events may bracket another such cluster. Between the two clusters is a longer period, at least 1,700 years, of quiescence. The finding suggests that the New Madrid zone may “kick real hard for a period of time” and then “shut off” for a longer period, Holbrook says. Holbrook and colleagues discovered the additional earthquake events using an unconventional approach: Knowing that the 1811 to 1812 quakes shifted the course of the Mississippi, the team decided to look for evidence of previous quakes by looking for evidence of previous changes in the river’s course. The team drilled sediment cores in the New Madrid area, analyzed them for evidence of earlier river channels, and dated them using radiocarbon and optically stimulated luminescence techniques. The resulting data allowed the team to reconstruct an approximate chronology of the river’s past courses. According to Holbrook, the river has a natural tendency to meander. When a fault that crosses the river slips, however, presumably producing an earthquake, even minor uplift of the land lowers the slope of the river and straightens it upstream from the fault. If no additional slips occur, the river regains its meanders after about 1,000 years. Based on evidence of meandering that was interrupted by straightening upstream from the Reelfoot Fault around 2240 B.C. and again in A.D. 900, Holbrook’s team inferred the beginning of the two apparent millennial-scale earthquake clusters. Martitia Tuttle, a paleoseismologist and director of M. Tuttle & Associates, a research and consulting company in Georgetown, Maine, says that Holbrook’s team’s approach “looks very promising” and that she is “eager to see the methodology tested elsewhere.” But because the river’s recovery from an episode of straightening is so gradual, she says, it may be difficult to see all slip events with this approach, so the chronology of events may be incomplete. In their own studies of New Madrid zone “sand-blown deposits,” which result from liquefaction of subsurface sediments during strong ground shaking, Tuttle and her colleagues found evidence to suggest that other strong earthquakes may have occurred between 2350 B.C. and A.D. 900 — more than what is suggested by Holbrook’s team’s research. For both these reasons, Tuttle says, it may be “premature to conclude millennial-scale clustering” with currently available data.